Apple Inc. hosted a press conference on Wednesday, September 7 at the Bill Graham Civic Auditorium in Downtown San Francisco and unveiled the iPhone 7 and iPhone 7 Plus. 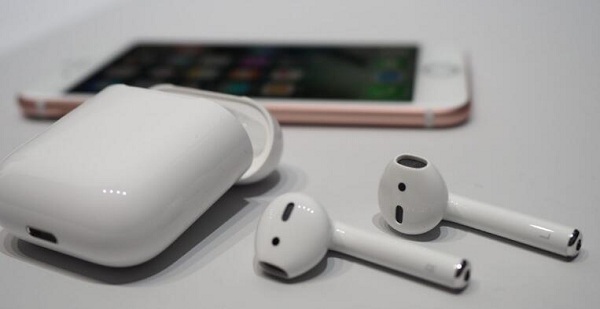 Apple's CEO Tim Cook took to the stage and confirmed that the company is ditching the headphone socket, meaning users will either have to use wireless Bluetooth headphones called AirPods to listen to music, or buy a pair of wired headphones that plug into the Lightning port - currently used for charging. The base iPhone 7 model with 32GB will cost $649. There will be a 128GB model as well as a 256GB model. Usually, you have to pay $100 more to get more gigs. The 32GB iPhone 7 Plus will cost a bit more and start at $769. Again, you can pay more to get more storage. You'll be able to pay $27 or $32 per month to get the iPhone 7 or iPhone 7 Plus respectively on carrier installment plans. The new iPhone 7 and iPhone 7 Plus will be made available for preorder beginning Friday, September 9th and and will ship a week later on September 16. The iPhone SE, iPhone 6s and iPhone 6s Plus are sticking around. This time, Apple is keeping two storage levels for each phone and bumping up the storage as well for the 6s and 6s Plus - 32GB and 128GB. The iPhone SE won't change, you'll be able to buy a 16GB and 64GB iPhone SE. The iPhone Upgrade Plan that was introduced last year is sticking around. So you'll be able to pay a monthly fee to get an iPhone and AppleCare+ directly from Apple. The iPhone Upgrade Plan is also expanding to the U.K. and China. All devices will ship at first in 28 countries, with 30 more countries one week later. The iPhone 7 is just as sleek as its predecessors, with the iconic rounded design returning for a third instalment with the same 138.3 x 67.1 x 7.1mm frame as the iPhone 6S. It's lighter though at 138g, down from 143g on the 6S. 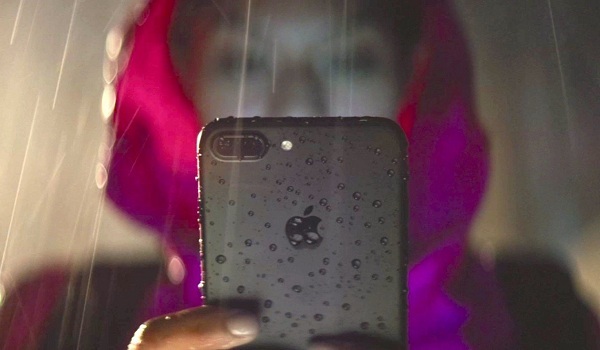 When it comes to the iPhone 7 water-resistant rating owners need to know exactly what it means, and hopefully get more clarification from Apple. 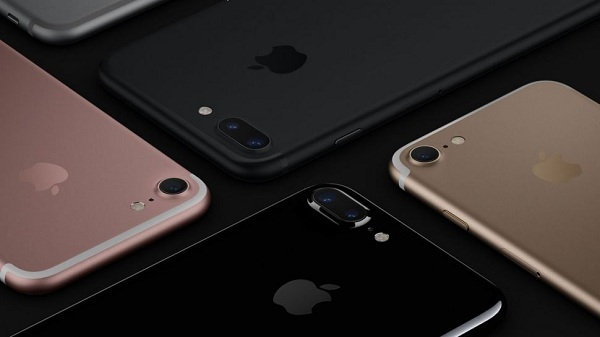 The new iPhone 7 and iPhone 7 Plus both have an IP67 dust and water resistant rating. This means they can technically be dropped in water and come out working just fine. That camera bump is a little bit special though. It's molded from the aluminum frame of the phone and houses the antennas - removing the ugly bands of its predecessors on the black versions. On the other colors though, the bands are still noticeable at the top and bottom of the device. There are two new colors as well, with the glass and aluminum Jet Black joined by the matte-finish Black option - the latter option also features a black Apple logo on its rear. You'll also get the choice of silver, gold and rose gold, but there's bad news for Space Gray fans: that option is dead. It's gone! It really has gone. Apple has removed the standard headphone jack - but it's not all bad news. You get a set of Lightning EarPods in the box, meaning you'll be able to plug in right away, while an adaptor is also included, so you can continue to use your current headphones if you wish - although it's certainly not the most elegant implementation. If you're feeling flush you can splash the cash ($159, 159 pounds, AU$229 to be exact) and get yourself a set of AirPods - Apple's first wireless Bluetooth earbuds. They offer five hours of listening on a single charge, dual microphones enabling you to take calls and interact with Siri, and touch response, so you can answer calls and launch Siri. The AirPods also come with their own case, which houses its own battery providing up to 24 hours of playback, as it will charge the buds when they're sitting in it. Pairing the AirPods with the iPhone 7 is easy: all you have to do is move the case near the phone and tap the on-screen prompt. 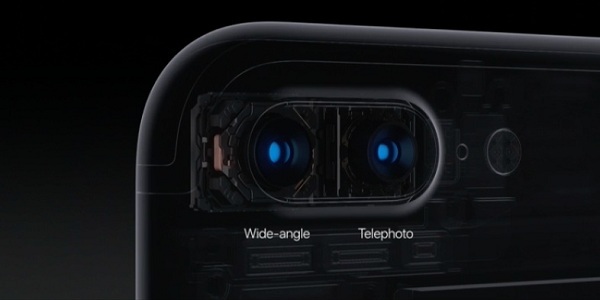 Apple has overhauled its camera tech for the iPhone 7, bringing in a brand new 12MP sensor on the rear and upping the front-facing snapper from 5MP to a 7MP Facetime HD offering (The iPhone 7 Plus gets a second, 56mm telephoto lens on the back that works like a built-in zoom feature. Phones like the LG V20, Huawei P9 and Huawei Honor 8 have two cameras, too.). The iPhone 7 has a completely new camera system, and gains OIS (Optical Image Stabilization), something the iPhone 6S missed out on but which the 6S Plus boasted. The wide-aperture lens on the back lets in 50% more light, and it's 60% faster and 30% more energy efficient. There's a six-element lens and the two-tone flash now has four LEDs for 50% more light and a 50% further reach. It also features a flicker sensor for artificial light, for better picture results. Apple says the iPhone 7 and iPhone 7 Plus have the best battery life of any iPhone - and so they should. It reckons those upgrading from the iPhone 6S can expect, on average, an additional two hours from each charge. Apple also quotes 40 hours of wireless audio playback and 13 hours of wireless audio. Which is nice. Apple has stuck with the same screen size and resolution from the 6S for the iPhone 7 - so at first glance there's not much to report. The 4.7-inch display sports a 1334x750 resolution, which in turns gives you a 326ppi pixel density. That served the 6S well, so you shouldn't worry about it on the iPhone 7. We understand if you're drawn to the pixel packed Galaxy S7 and S7 Edge though. 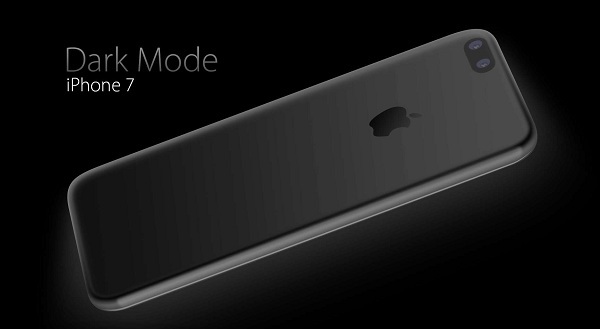 However, crank up the brightness bar on the new iPhone and you're eyes will be in for a treat. Apple has upped the brightness of the display on the iPhone 7, for an even brighter, bolder visual experience. The iPhone 7 and iPhone 7 Plus are faster, more powerful, sleeker and better equipped than any other iPhone Apple has ever built. It finally start at 32GB of storage. And the iPhone 7 comes in 128GB and 256GB - a new high for iPhone storage that brings Apple's smartphone to parity with the iPad Pro. Larger iPhone Capacities can help you to save more movies or TV shows. 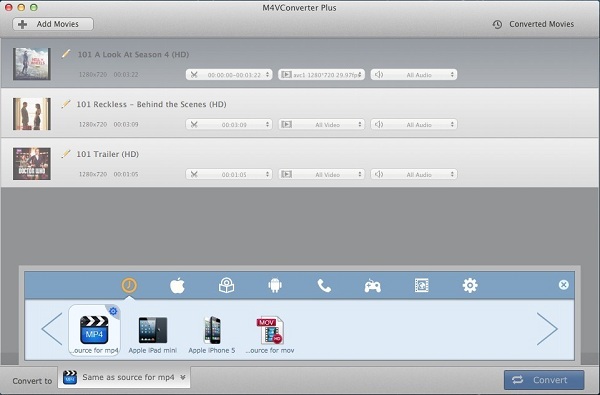 If you have purchased movies or TV shows from iTunes Store and want to watch them on your new iPhone 7 freely, M4V Converter Plus is the pratical tool for you. With it, you can convert iTunes purchased videos to iPhone 7 easily. It allows you to convert iTunes movies, Rentals and TV shows to iPhone 7 with original quality kept. In this way, you can share iTunes playlist with your friends and family at will. This guide will tell you how to convert iTunes movies or TV shows to the new iPhone7, free download the application on your computer and have a try. 1. Install and open the program on your Mac, you will see the intuitive user interface on the right. 2. Add Movies or TV shows from iTunes library to the program. To add iTunes videos, you can click Add Movies button. 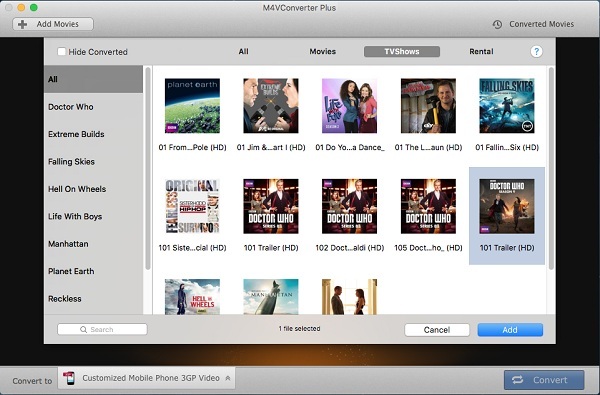 It will pop up the adding window, you can select iTunes purchased movies, Rentals and TV shows as you need. Then hit Add. 3. Choose a proper video format for your new iPhone. There are two options for you to choose a proper output format for your iPhone 7. On one hand, you can click Convert to profile -> Apple Device. 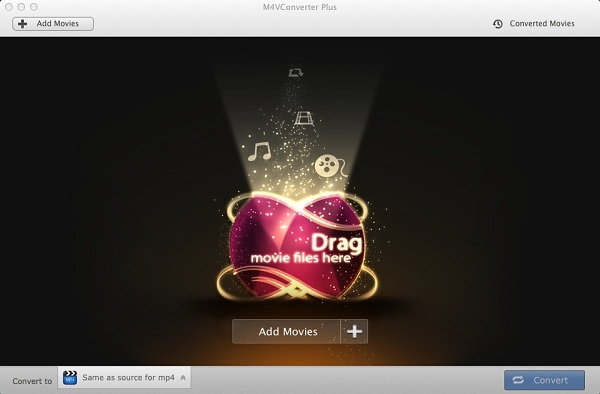 On the other hand, you can convert DRM M4V to plain video or audio formats such as unprotected MP4, M4R, MP3 and so on. 4. Click Convert to start the conversion. Wait a moment, you can find the target files on Converted Movies folder. Now you can watch iTunes movies on your new iPhone 7 freely.